I've had such a wonderful, relaxing weekend! It was just what I needed after a week of traveling and holidays. I hope that you all feel refreshed and ready to get back to work / school! We had a fantastic time with our friends last night. Dinner was amazing, roasted chicken breast with onions, garlic and carrots, a side of steamed broccoli and savory grits. All accompanied by two glasses of cabernet and finished with a medley of cheesecakes that we all sampled. I was so disappointed that in my rush to get out of our house yesterday I forgot to grab my camera, so I have no evidence of our fabulous eats. After dinner we just hung out and chatted for a few hours, but had a little break in the middle to play Rockband!!! So so so fun! :) I'm REALLY disappointed that I don't have pictures of that! I was awakened early this morning by one of our pups, and after dealing with her was unable to get back to sleep. So I got up and made myself a pre-breakfast snack (the hubb had big plans for an egg breakfast and I didn't want to ruin it for him). 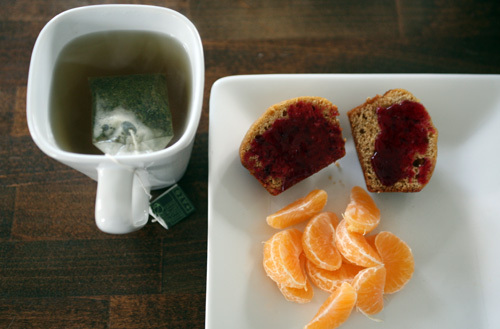 Snack: 1 cornmeal muffin spread with cranberry "ketchup", 1 clementine and a cup of green tea. After being up for a couple of hours it became clear that the hubb still wasn't ready to roll out of bed so I decided to go ahead and have breakfast without him. 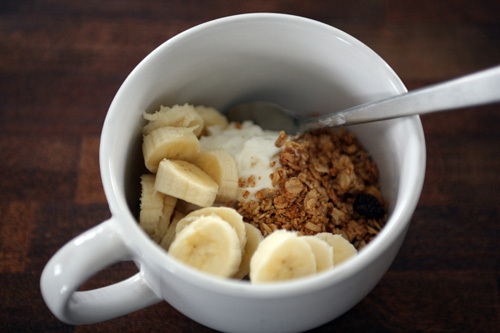 Breakfast: A 6oz cup of 0% Fage topped with 1/4 cup TJ's pumpkin spice granola and a sliced banana. Sadly, my hubb emerged from the bedroom just after I finished my breakfast. 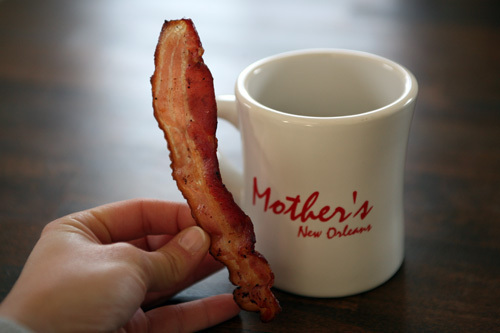 I snagged a cup of coffee and a piece of his bacon while sitting with him through his meal. At lunchtime I went to my favorite 75-minute Vinyasa Yoga class at Studio 206. It had been three weeks since I'd been and it felt great to be back. Man oh man, Hilary kicked my bootie! It was a wonderful, intense class that had me drenched by the end. I was worried that I would be too sore from my run yesterday but the yoga really helped to loosen me up. I love the combination of running and yoga and what it does for me both mentally and physically. My hubb picked me up at 2pm and I was ravenous so I helped him finish the french fries he'd picked up while running errands. Once home I made myself a quick, late lunch before heading out into the yard to plant some bulbs. 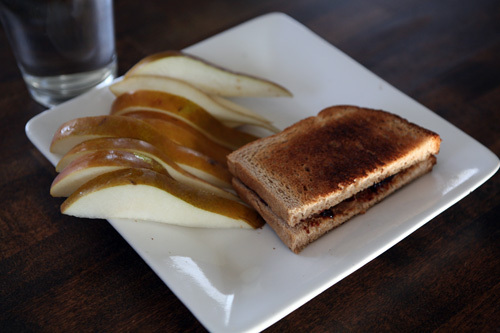 Lunch: 1/2 an almond butter and sour cherry preserves sandwich on whole wheat bread and a sliced pear. I planted 150 spring bulbs in hard Virginia clay for 2+ hours this afternoon. I really hope that they come up, they should have gone in the ground a month ago but I just never got around to planting them. The bulbs I planted two years ago are already peaking up above the mulch, so we'll see what happens with my newbies. The yard work was another workout in itself...2+ hours digging in hard Virginia clay will leave you t.i.r.e.d. Snack: I was starving again when I came in just before dark (its been such a snack-filled day!) 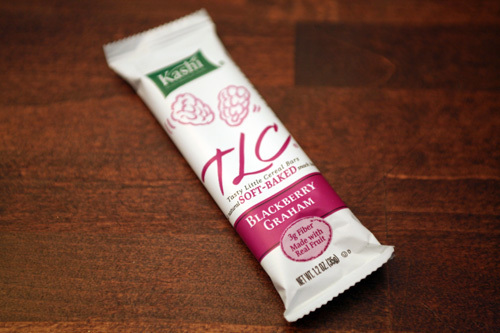 so I grabbed this Kashi Cereal Bar sample I got in the mail the other day. I've seen these on the my grocery store's shelves but they are kinda pricey so I haven't picked any up yet. 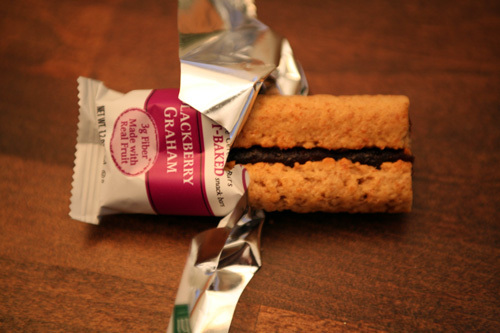 It was pretty good...reminded me of a Fig Newton or Nutrigrain bar. 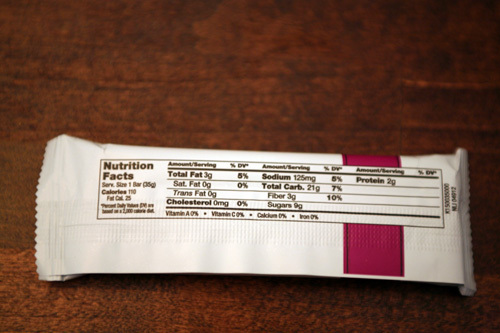 The blackberry filling was quite tasty, and the texture of the bar was nice and soft. Would anybody like a couple of Kashi Cereal Bar $2.00 off coupons? I can send two coupons to two separate people. Leave me a comment if you're interested by 8pm tomorrrow (Monday) and I'll have my magic number generator (a.k.a. my hubb) pick a random number. I'll announce the winners on tomorrow night's post. 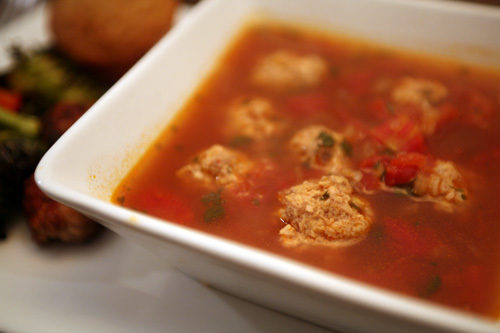 For dinner tonight the hubb and I made Mexican Meatball Soup. I first saw this recipe on Kristin's blog, The Kitchen Sink. If you haven't checked out her blog yet you really should. She makes beautiful meals and baked goods and has absolutely gorgeous photography. 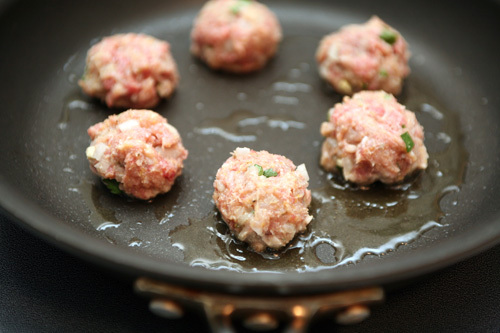 The recipe is originally from Bon Appetit. Kristin made a few changes, and I made a few more. 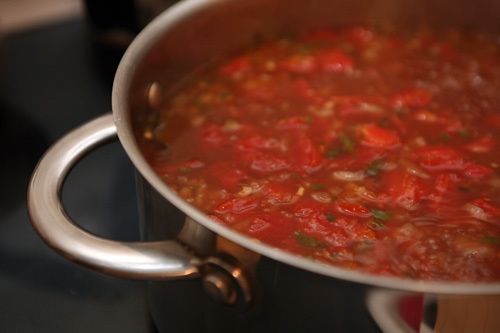 This soup is delicious and hearty. The hubb and I enjoyed it VERY much. There is just one change that I will make the next time this meal meets our table and I've indicated it below. Warning: This soup requires a LARGE pot. 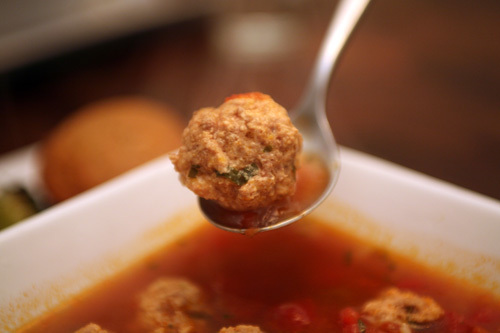 I started it in my standard soup pot and had to transfer everything to a large stock pot when the meatballs went in to prevent it from overflowing. 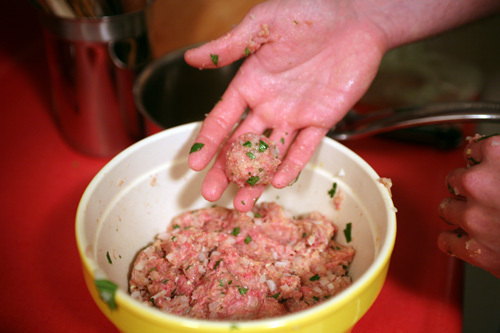 We used more meat than the original recipe called for so we of course had a few extra meatballs. 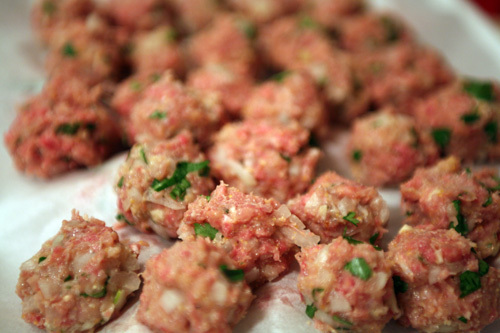 The hubb took care of these by pan-frying them in a little olive oil. 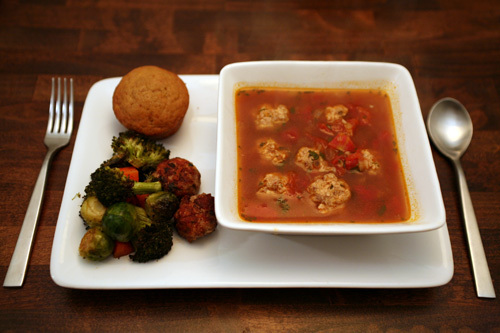 Dinner: A bowl of Mexican Meatball Soup with 7 meatballs, a side of roasted veggies (carrot, brussels and broccoli), two additional pan-fried meatballs and a cornmeal muffin.